In 1988 New Haven, Connecticut initiated a Public Art Competition for a site at Long Wharf Park. Michael Singer won the competition with a proposal to use the Public Art funding meant for a sculpture at Long Wharf Park as a way to finance an urban plan for the entire site. The site is located adjacent to Interstate 95, encompasses the historic Long Wharf to the north, one mile of harbor front and a defunct water treatment facility to the south. Singer, as an artist, led a team consisting of an environmental engineer, historian, social anthropologist, biologist, interpretive planner and architect, defined the site as a place to understand the impact of human intervention over a four hundred year period. The master plan recommended mitigation strategies for the cleanup of the polluted harbor front, as well as educational, recreational and cultural programs. The master plan included addressing the existing Vietnam War Memorial, a sculptural tidal garden, historic and interpretive planning, park amenities, a program for food vendors and the restoration of Long Wharf. The master plan also investigated a number of possibilities for reusing the defunct water treatment facility at the south end of the park including reusing the buildings as an aquaculture facility. Michael Singer was subsequently involved in the evolution of the project through 1998 and helped to support the implementation of several of the following project components. 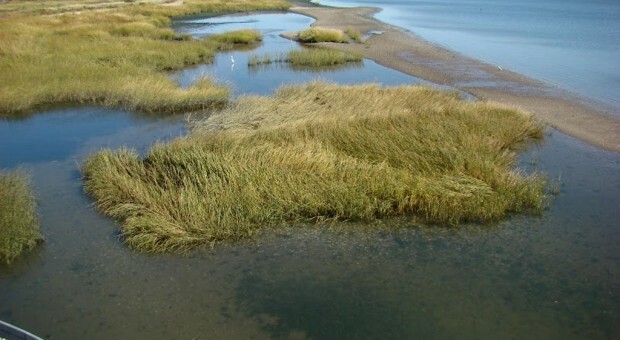 In 1994 the New Haven Land Trust and the Garden Club of New Haven created Long Wharf Nature Preserve restoring 24 acres of mud flats, dunes, salt marshes and upland habitat at the southern end of Long Wharf Park. The land was donated by the City of New Haven and remains a model precedent of urban ecological regeneration. The site includes a trail system and an informational panoramic display of the Harbor and New Haven‘s East Shore. In 2011 the New Haven Land Trust fought off a land grab by the Connecticut Department of Transportation to seize part of the preserve for a new I-95 off ramp. In 2003 the Sound School opened its new Library and Aquaculture Center located on the foundations of the water treatment facility. The Sound School is an inter-district college preparatory high school that concentrates in the study of aquaculture and marine trades. Long Wharf Pier is now home to the historic schooner replica Amistad (of the famous slaveship revolt) which conducts public and private sails and tours. The pier is also the home of the historic schooner Quinnipiack which provides seasonal private sails and marine environmental programs for schools and organizations. This project was funded in part by the National Endowment for the Arts.